You can’t really ask for a more traditional breakfast than pancakes smothered in butter and pure maple syrup. Pancakes are very easy to prepare at home, and they make the house smell so good. The only reason to go out for pancakes is if you were up late and are looking forward to that complimentary bottomless mug of coffee at I-Hop. Pancakes require a few basic ingredients and a hot griddle. The George Foreman Grill, with the removable griddle plate attachment, works perfectly for this. The surface is non-stick, and clean-up is easy because the griddle plate can go right onto the dishwasher. It is possible to make pancakes on the Basic Grill as well. They will just have grill marks. There are plenty of boxed pancake mixes that only call for water to be added. You can do that if you are in a hurry. Some of them are really fine. We are going to explore a couple of homemade recipes here, one traditional and one to spark the interest of someone on a healthier path or a special diet. Both can be made on the Foreman Grill. A classic pancake recipe has pretty much everything you might already have in your pantry and refrigerator make delicious, sweet breakfast cakes. Even if there is a blizzard outside, you probably have the ingredients to whip up a batch of pancakes without having to drive to the store. While this recipe is basic and traditional, feel free to add any fruits, nuts, or sweets that make you happy. Pancake batter can handle whatever goodies you toss into it. It is basically a cake cooked on a flat griddle. Chefs and home cooks put all sorts of things into cakes and they still rise and taste great (for the most part). The following recipe is adapted from a Food Network Kitchen archive of classic recipes. You will need 2 large bowls. In one bowl, whisk together all of the dry ingredients. In the other bowl, beat the eggs and then whisk in the milk, vanilla, and butter. Add the wet ingredients into the bowl of dry ingredients and whisk until a thick batter comes together. Set this aside for 5 minutes. Note: At this point you can stir into the batter some fresh blueberries, bananas, or dark chocolate chips. Place the griddle plate into the bottom of the Foreman Grill and turn the grill on medium heat. Wait for it to come up to temperature. Spread some butter on the hot griddle plate. Pour or ladle 1/4 cup of batter onto the hot griddle to form a pancake. Do this for as many as will fit – 2 to 4 well spaced. Allow to cook until little air bubbles break the surface of the cakes and the undersides are golden. This will take 1 to 2 minutes. Flip the pancakes with a plastic spatula and cook the other side for another 1 to 2 minutes or until they reach a golden-brown color. Remove the pancakes from the grill and serve warm with butter and pure maple syrup and any other toppings might enjoy. Try these suggested toppings: Toasted nuts, fresh strawberries, warm fruit compote, chocolate syrup, butterscotch, honey, yogurt, whipped cream, or whatever you have on hand. Basic Grill method: If you have a basic grill without the removable flat griddle plate, you can cook the pancakes by buttering the top and bottom grill surfaces and then closing the grill top over the pancake batter that has been ladled on the bottom grill. This method cooks fairly quickly because it heats both sides at once. Your pancakes will have grill marks, but they will taste the same. This method may take a little trial and error to perfect. Looking for a Gluten-Free Pancake Recipe? Many of us can’t tolerate gluten, or have chosen to take it out of our diets. If you are one of the several who are on this path, you may be missing things like pancakes, waffles, and muffins for breakfast. You really don’t have to give these things up. You can make great tasting breakfasts and baked goods with the many gluten-free, whole grain flours available. Whole grain flours contain more dietary fiber, protein, and minerals than all-purpose white flour. Here is a recipe that is gluten-free that can still be made on the Foreman Grill. It has plenty of flavor and a really nice texture. This version of pancakes is adapted from the Nourishing Meals archive of breakfast recipes. On the website there is a similar recipe that is the vegan version that uses bananas in place of the eggs. In the other bowl, beat the eggs and then whisk in the milk, applesauce, coconut oil, and maple syrup. Spread some coconut oil on the hot griddle plate. Remove the pancakes from the grill and serve warm with the apple slices and pure maple syrup on top. Pancakes are the quintessential breakfast food. The batter is a blank canvas for anything you want to add to it to impart more flavor and texture. You can also top the griddled cakes with pretty much anything, such as fruit, chocolate chips, trail mix, flavored yogurt, or syrups. The possibilities are pretty vast. There are no hard fast rules where additions and toppings come into play. Making pancakes on a Foreman Grill is quite easy. The temperature of the grill remains constant and heats evenly. The removable griddle plate is a cinch to clean. The next time you want to have a comforting and fun breakfast for your family or friends, try this idea out. Set up a toppings bar. This a little bit like the taco bar concept. Have platters or bowls of all different kinds of toppings, such as the ideas mentioned in this article. Make batches of pancakes on your grill and keep them warm in a low oven. 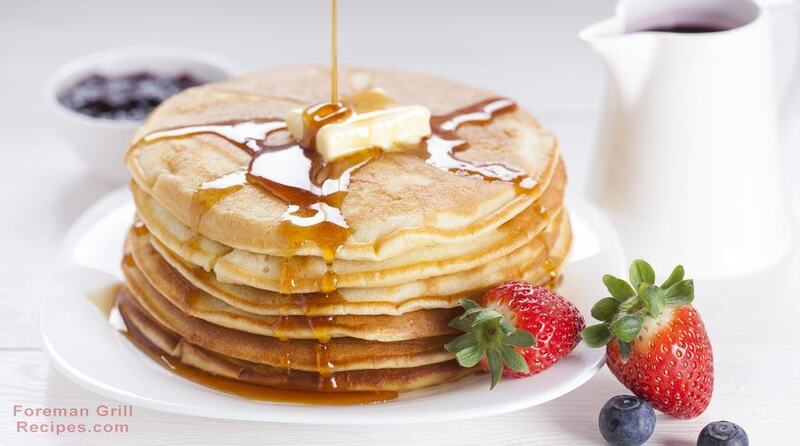 Serve up a platter of pancakes and let everyone hit the bar for their individual, favorite toppings. Enjoy.